A spirited and practical manifesto for improving the odds of making a heaven on Earth. Dutch journalist and economist Bregman opens with an ennobling proposition. 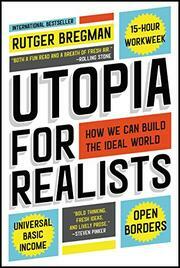 “In the past,” he writes, simply, “everything was worse.” Then, a couple of hundred years ago, something happened: technological innovations allowed wealth and social welfare to spread, such that “a homeless person receiving public assistance today has more to spend than the average Dutch person in 1950, and four times more than people in Holland’s Golden Age.” Utopia, or nearly so—at least from the point of view of someone born as recently as in the times of Georgian England. So what happened? Well, there’s predatory capitalism, the rise of a social order that encourages us not to care about others, and, perhaps worst of all, the advent of a supermechanized age in which “advancing technologies are laying waste to ever more jobs.” What to do? Counsels Bregman in a spry, engaging argument, if we can’t smash the machines—and that would be a start—then we can certainly try to stay a step ahead of them, for education will play an important role in the near-future economy “as long as machines can’t go to college.” Meanwhile, in the interest of political stability, if nothing else, the advanced nations might take a more proactive approach in sharing the wealth, not just within their own borders, but everywhere. Then there’s perhaps the most utopian ideal of all, the idea that when we choose to work, we ought to be working at something that we find important and with intrinsic value—that, and, well, monkey-wrenching the system, and all with an eye to living more satisfying and healthy lives, the pronounced goal of a whole library of self-help books. Raise the minimum wage? No. Give everyone a basic income, smash the machines, and work a couple of days per week—that’s the ticket. A provocative pleasure to contemplate.